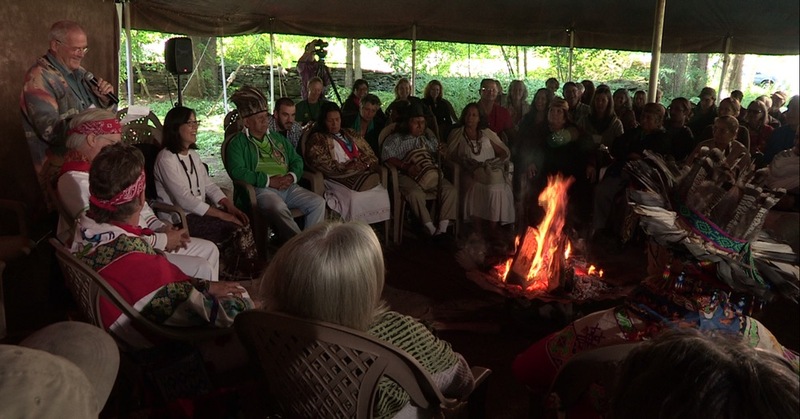 The 2015 Ancient Wisdom Rising (AWR) gathering is over, but I will continue to savor the rich experience of being with over 180 kindred spirits for two days as we enjoyed the wisdom of several prominent elders from around the world. There were so many compelling stories to hear: How Marcos Terena (Xane´, Brazil) and others from around the world have been fighting for the sovereignty of indigenous peoples to be officially recognized at the United Nations, a right that was finally won in 2007. Chief Caleen Sisk (Winnemem Wintu Tribe in California) spoke of the challenges of her people who have seen their numbers dwindle to less than 150 and are, yet, striving to maintain their traditions while the U.S. government does not recognize them. The Winnemem Wintu continue to experience challenges to access their sacred sites that are held by the Forest Service or private landowners. Chief Sisk’s efforts to protect her cultural traditions and sacred sites were recognized when she was bestowed the 2015 Wisdom Fellowship Award by the Sacred Fire Foundation. Benerexa Marquez and Bienvenido Arroyo (Arhuaco, Colombia) spoke of the battle to maintain control of the linea negra, which delineates the ancestral homeland of the peoples of the Sierra Nevada of Santa Marta, an area of sacred mountains in Colombia that are considered to be the “heart of the world.” While these challenges can seem overwhelming, the elders shared that the indomitable force to persevere comes from their traditions and rituals. As participants, we experienced some of that grace ourselves when we experienced the magic at an early morning meditation when Scott Sheerin and R. Carlos Nakai played the flute, and Shri Vivek Godbole added chants from his Vedic tradition. Mamadouba Camara delighted us with an evening of enlivening drumming from the Guinea tradition, while his wife Pam danced enthusiastically on stage and encouraged many of us to join her in this joyous celebration. The movement and play continued as we joined the Haudenosaunee Dancers and Singers on our last afternoon together. Did I learn something new at AWR? Yes, there were many new stories about the ongoing struggles to keep ancient traditions alive as modern life with its voracious appetite for resources threatens to steam-roll over whole cultures. At the same time, many of the elders were speaking about themes that many of us have been hearing around the fire: How the land is alive and intimately connected to the ancestors and the traditions they practiced and that we must restore our deep relationship to these lands and the waters that nourish us. We also learned that traditional wisdom is not some quaint anachronism, but holds important lessons for us as we seek to create a more sustainable way of life. Acknowledging the forces of destruction and imbalance can seem overwhelming, and yet the elders kept reminding us about the surprising power and grace that comes from following in the footsteps of those who lived in a harmonious way for thousands of years before our modern era. I came away from the gathering with a cautious optimism. Our way of life is in trouble. But the Arhuaco, Xane´, Navajo, Winnemem Wintu and Vedic traditions have endured. Perhaps, just perhaps, we will too.